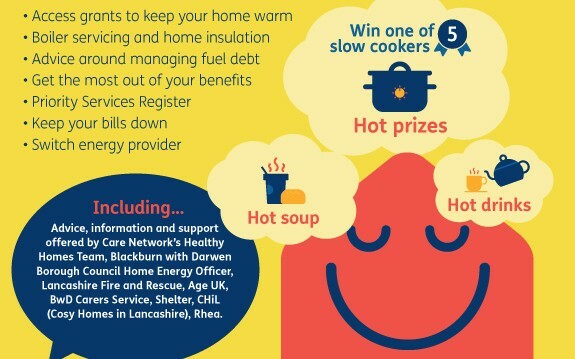 Fuel Poverty Awareness Day takes place on Friday 15 February and to mark the day Care Network Hub will be hosting ‘Blackburn with Darwen’s Biggest Housewarming’ event from 1pm – 3pm at 9 Town Hall Street, Blackburn, BB2 1AG. The event, which is open to both residents and professionals, will help to raise awareness of the risks linked to people living in cold homes, as well as the support available to help people combat fuel poverty. People with long term health conditions, mental health issues, disabilities and families with young children are most at risk from living in a cold home. The event will also help people to recognise the signs that people are struggling to heat their home. Why not come along and meet the teams working to keep you warm, save you money and help you stay healthy at home – and see what a difference they can make. Advice, information and support will be on hand from Care Network’s Healthy Homes team, the Council’s Home Energy Officer, Lancashire Fire and Rescue, Age UK, Blackburn with Darwen Carers Service, Shelter, CHiL (Cosy Homes in Lancashire) and Rhea. There will be free hot drinks and soup plus a chance to win one of 5 slow cookers.